Are you all busy creating your entries for My Favorite Things 2017 Card Design Superstar contest? I know I am! And today I have my entry for the Innovation Master category. 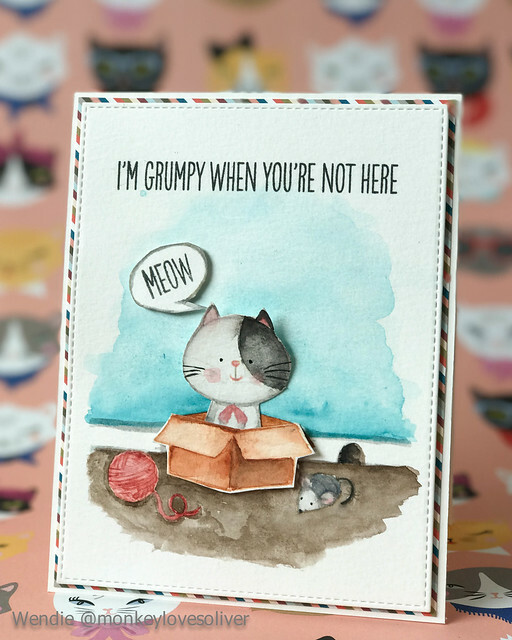 This card features an oldie but goodie from My Favorite Things – I Knead You. This card was a bit of an engineering puzzle. First, I was deconstructing a “stationary” stamp to make the kitty move up and down. And second, the two slider elements I own are curved, not straight. I also wanted to keep this as single layer as could. It took all day. And more than one attempt. But how cute is that kitty popping her head out of the box?! 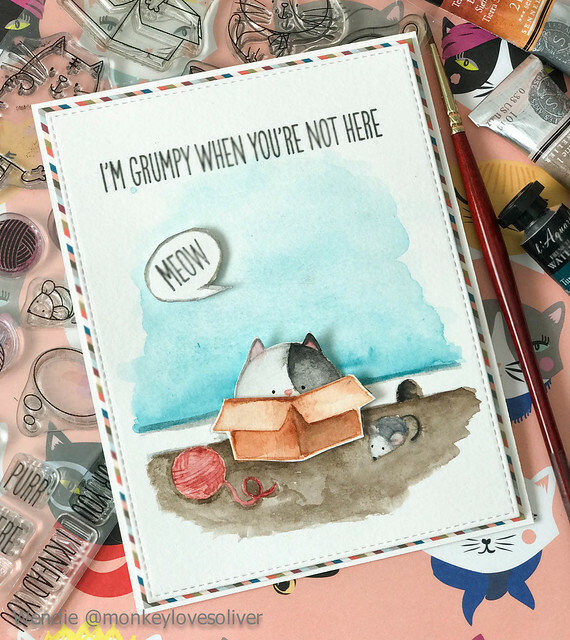 So first, I stamped the kitty/box a few times – once so I could cut out the kitty, once so I could have a box front to pop out, and once so I could have a base on the card panel itself. I stamped all three with Distress Ink in Antique Linen for some no-line watercoloring and then painted away. I decided to make kitty look like my Ollie cat because he looooooves boxes. I also painted the background and foreground elements at this point. Like that little mouse house in the baseboard? I fussy cut the kitty and a box front to use as the dimensional elements. Then I stared at everything trying to figure out how to move on to the next step: slider action. I ended up making my own slider channel with some scrap cardstock. I also cut a slit along the top front edge of the box so kitty’s gigantic head would fit. It’s not a super smooth slide, but it works. I loaded the watercolor paper with foam tape to give kitty some room to slide. 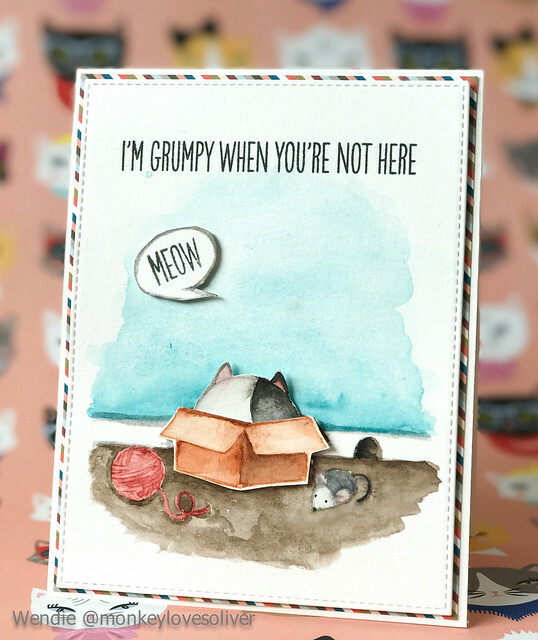 I used foam tape to adhere the box front and “meow.” I trimmed the panel with some striped paper from the Free Spirit patterned paper pack and then adhered it to my top-folding A2 card base. And there you have it, a makeshift slider card. Thanks for stopping by!